check banner outside the health centre. The event is free and is open to all – not just for patients of the Frome Medical Practice. Patients will be able to obtain several different health checks such as blood pressure, lung function screening and urine testing. 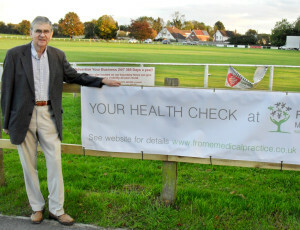 Frome Medical Practice patients will also be able to have their cholesterol and glucose checked. In addition, medical teams will also be available offering advice on subjects from smoking cessation, weight and exercise to sexual health. Emma added, “What promises to make this year’s event special is that local support groups and societies, from those dealing with carers to hospice care and disabilities, will also be attending. “Over the last few years, with organisations such as Health Connections Mendip, help for general health and well-being has also started to be delivered outside of the GP surgery and is now available via support groups working within the community. The Frome Leg Club and Healthy Mondays at the Cheese & Grain are just two such examples. Senior partner at the Frome Medical Practice is Dr Tina Merry. She said, “The whole Health Check event is down to the initiative and energy of Emma, her colleagues and our patients’ support group -the Patient Participation Group. For any further information contact Kaylyn Hudson on 01373 468105.